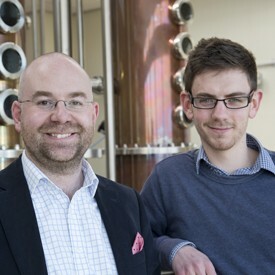 Richard is the head of finance and sustainability and Ben is the environmental sustainability manager at Adnams, an award-winning regional brewery and distillery based in Southwold. Famous for its eco-distribution centre, its energy efficient brewhouse and its 240,000 honey bees, Adnams describes itself as a values-led, purpose-driven business. Often, this is by trying to put a price tag on the environment, an approach that can be disingenuous or spurious. However, there are many organisations that already understand the link between these two disciplines and recognise that where there is an environmental business case for a project, there is also an economic rationale. That business case typically takes the form of cost savings or business resilience (and there is a growing cohort of investors who recognise that purpose-led businesses with long term, sustainable aspirations are outperforming their competitors). In addition, many customers are turning to businesses that have a cache of trust and credibility. Recent scandals (adjusted vehicle emissions, undisclosed horsemeat, banking ethics) have reinforced that behaviour. At Adnams, our sustainability agenda is led by an accountant and an environmental scientist. The link between these two disciplines is therefore inevitable, and skills from each can be readily applied to the other. We have clear evidence to show the synergies between responsible behaviour and our improved business performance, which suggests that the economic imperative for sustainable thinking does not need to be manufactured or forced. This blog post sets out a concept from the world of finance that we have applied very successfully to our environmental management. It has produced significantly improved environmental efficiency, by which we mean greater output for a smaller environmental cost. That concept is environmental gearing. We proceed by explaining gearing in the finance world and then setting out how it also relates to the environmental world. We provide some examples of its application within Adnams and demonstrate how we’ve used the data to make savings. Our concluding remarks demonstrate that this concept can be applied across different organisations and processes to reveal a significantly improved understanding of one’s operations and, consequently, enhanced environmental and financial efficiency. Finance professionals typically refer to two types of gearing: financial gearing and operational gearing. Financial gearing, or leverage, refers to the financial structure of a firm, i.e. the ratio of debt and equity (shares) in its capital structure. There are numerous papers on the significance of this relationship (the most famous being by Modigliani and Miller) but the relevant comparison here is the cost of those sources of finance. Debt usually carries a fixed or pre-determined cost, i.e. a defined interest rate, where equity provides a return to investors that is more variable and, at least in theory, follows the performance of the business. One of the most significant implications of an organisation’s level of gearing is its ability to raise further finance. Banks may refuse to lend capital to a company with considerable debt. However, a company may often prefer to finance itself using loans since the cost of that capital is typically lower than the dividends that shareholders demand, because their income stream is variable, i.e. riskier. For completeness, interest is also a tax deductible expense where dividend payments are not. Operational gearing is also a financial measure. It compares an organisation’s operational commitments with its ability to react to changing circumstances. For example, a company that owns a warehouse will carry the cost of that operation regardless of its economic prosperity. A company that must rent storage space on an ad hoc basis will see its costs rise as volumes grow and fall when they decline. Arguably, the former is better placed to deal with the good times where the latter is more resilient in poorer times. Over the past three to four years, it has become clear to us that these concepts apply equally well to a company’s environmental impacts. We began to test our hypothesis in our brewery and were then able to quickly and readily apply it to our distillery, our logistics operations and our property estate. It applies to all aspects of our environmental framework (outlined below), though only qualitatively in some cases. At a fundamental level, an organisation can (and should) identify its fixed and variable environmental impacts. Most operations will have a base load of electricity, gas, water or similar and then a variable element that is proportional to the output of the task in hand. The ratio between the fixed and variable environmental impacts is what we describe as the organisation’s environmental gearing. It therefore follows that a company can seek to exploit that ratio to ensure that maximum efficiency is made of the fixed proportion. The analogy between an organisation’s financial gearing and operational gearing continues. Where an organisation is too highly leveraged (i.e. carries too much debt), it cannot raise further finance. The same is true with its environmental output: when its fixed emissions or water consumption gets too high, its reliance on and potential wastefulness of scarce resources will lose it favour with suppliers, customers and investors. Conversely, if it relies wholly on variable impacts, it is unlikely that it is behaving in the most efficient way possible. It therefore stands to reason that understanding one’s environmental gearing can reveal numerous improvements to the way one operates. At Adnams, we have developed a four-pillar environmental framework. We have learnt that each pillar must be considered with respect to the others and we include our suppliers, customers and competitors in our thinking. This framework has held good in all our business activities over the past few years, and indeed has been adopted by other organisations with whom we have shared it. The concept of environmental gearing applies in each area where quantitative data can be sought: with a relatively small series of data we can easily identify the fixed and variable carbon, water and waste costs in any business stream. From that, we can ensure efficiency within those processes to keep our impacts and costs low, and our business sustainable and resilient. Within Adnams, this was perhaps the most obvious source of data and the one that triggered our thinking on environmental gearing. The simplest illustration of this is that our brewing operations require the heating of water and equipment. We identified that starting the boiler each morning was an intensive part of our gas consumption. It therefore stands to reason that getting as many brews from that initial, fixed cost makes good business sense. It makes much better environmental sense because we are getting every possible benefit from that initial energy (carbon) use. Following this observation, numerous other examples began to reveal themselves and almost any part of any process can be expressed in terms of its gearing ratio, pointing to further efficiencies or opportunities. For example, our fleet operation has both fixed and variable elements of environmental impact. The embodied carbon in each vehicle, the first few miles of the journey and so on remain irrespective of customer demand. The number of stops or weight of the vehicle are entirely variable based on delivery volume. Thus, when we reduced the weight of our glass bottle (which in itself has lifecycle carbon and water benefits) we are directly affecting the variable carbon emissions of the vehicle: it can carry more bottles or operate at a lower net weight, thus improving its efficiency. As before, the merits are environmental and economic. Our water consumption illustrates the point most clearly: we use the same amount of water to wash our pipework and vessels regardless of how much beer we’ve brewed in that batch. It therefore makes sense to produce as much beer as possible before washing the equipment. Of course, the beer we produce has to be sold or we are wasting the variable element of our energy and water consumption. Fortunately, because we have many fixed costs, bigger brews reduce the average cost per pint and thus we move to a more competitive position in the market place, both economically and environmentally. Note: the concept of gearing naturally reveals a shortcoming in the migration of customers towards “better” producers: if customers leave their previous choice of manufacturer, those other breweries are producing less beer for every kWh of energy or litre of water used. Their reduced efficiency is a negative environmental impact so a commercial imperative to understand one’s gearing ratio emerges. The net effect of the move hopefully remains positive. Our waste is predominantly variable, at least in terms of spent raw materials. This is important for us to know because it represents one of the biggest environmental risks for our business; further production growth will increase our waste at a proportionate rate. This suggests that we are limited in the efficiencies that we can make here, which means we must concentrate on absolute reductions. Biodiversity, our fourth pillar, is an area where results are generally always qualitative. Whilst there are accepted quantitative indicators for measuring biodiversity, we have not so far found them to be useful. We still recognise that impacts can be fixed or variable though. For example, a logistics operation requires a change in land use that can potentially have an adverse effect on a site’s biodiversity. The business has a responsibility to maximise the efficiency of its warehousing operation in order to fulfil its operations with minimal environmental disruption. If it did not, the environmental impact would grow unnecessarily as the business expanded. We have identified the importance of looking at our four pillars holistically. Failure to do so could lead to some irresponsible decisions. Similarly, the concept of environmental gearing can be applied across the framework. For example, had we eliminated our base load (fixed) water requirement from the mains supply by using processed seawater instead, we would have increased both our fixed and variable energy use just through operating the desalination equipment. Thinking about our gearing at an organisational level helps us to make broader, bolder decisions that exploit our environmental gearing to its maximum. For example, we have examined projects to share generated heat between properties. As a result, we are installing a second series of heat exchange equipment to use waste heat from our production processes (i.e. the result of fixed energy consumption) in other nearby buildings, thereby removing their variable demand. We can use our knowledge beyond our direct organisation too. Working with our suppliers provides a raft of opportunities to maximise our combined efficiency, thus improving the environmental credentials of East Anglia and generating better economic prosperity. Without doubt, understanding and exploiting our environmental gearing has made a significant difference to our environmental and economic successes. In 2016, our production output increased by 14% when our energy usage increased by just 4%. This is clear evidence of improved environmental efficiency. The concept of environmental gearing can be applied to most aspects of an organisation. We identified it first in our brewery’s gas consumption but have subsequently seen the same relationship and usefulness in everything from our water use to our logistics efficiency. Accountants pursue efficiency and business benefits every day. The environmental community have a similar agenda but finding a common language often proves challenging. Seeing the synergies between the two disciplines (rather than trying to manufacture or force a link) must be seen as a priority. Environmental gearing is one such relationship that is reassuringly clear. That it comes from a partnership between an accountant and an environmental scientist should demonstrate its usefulness. Richard will be the guest speaker at the next edie Leaders Club breakfast briefing on 27 April at the Charlotte Street Hotel in London, where he will be discussing how sustainability professionals can engage effectively with the finance department and speak their language to get them on-board. The edie Leaders Club is an exclusive, member-only group for more than 200 sustainability leaders, who come together to share knowledge, experience and best practice in the journey to make business more sustainable. Submit your membership application for the Club here.